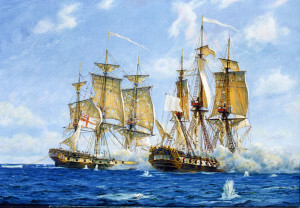 American War of Independence, ” The Nelson and Trafalgar Collection”. A marine painting by Gordon Frickers 61 x 91 cm (24″ x 36″), oil on board, the original was a private commission. If you are interested in commissioning or acquiring a similar painting. Frigates, HMS Maidstone verses Lion. “Maidstone” was easy to research, “Lion” a bit more difficult. I found this story in the Naval Chronicle at Plymouth Naval library on my second attempt..
That library has been closed by Plymouth Council, a loss to Plymouth’s culture and heritage, it was a very fine collection complementing, even rivalling the Greenwich National Maritime Museum collection and Plymouth with a first class curator. The first story I found was perfect, even a ballad written, until I checked the times. It was a night action! 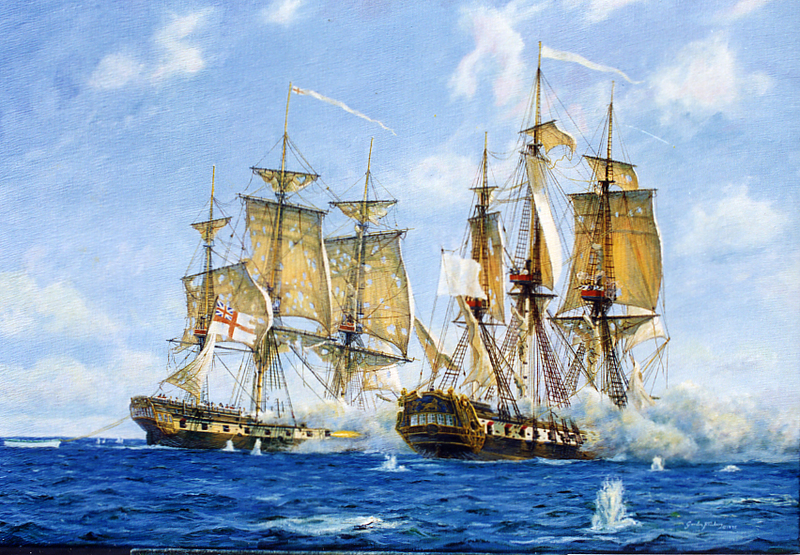 “Maidstone“, frigate 28 guns, British attacked the larger French “Lion“, 40 guns. Normally that should have been fatal for “Maidstone” as “Lion“‘s guns were bigger as well as threw a lot more weight of metal. “Maidstone” was driven off, her rigging badly damaged. For 2 hours she self-repaired then attacked again. 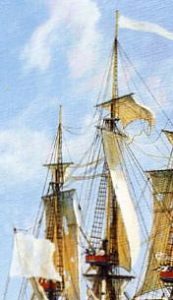 At that time the English preferred to get in close, ideally off the bow or stern (see “Four Treasure ships” on my web site), the fire into the hull and board at the first opportunity. The development of the ‘cannonade’ a weapon devastating at a short range further encouraged that style of fighting. At that period the French took a very different approach to ship to ship combat as shown in this painting, preferring to fire at the spars and rigging to disable the opponent thus force her surrender with a hull largely undamaged. Respective casualty figures from sharp actions illustrate this difference time after time. Many of “Lion“‘s crew were sick and weak with illness and hunger. Although well-handled and bravely fought, eventually “Lion” submitted, was captured by “Maidstone“. Flags to note, “Lion” flying a white flag, the correct flag for the period for a French man of war. The white flag shown as flown by “Lion” was at that period the French Marine National flag, pre the development of the modern, familiar, tricolour flag. HMS Maidstone is flying the pre union with Ireland flag, again, correct for the period and location, a white Ensign. 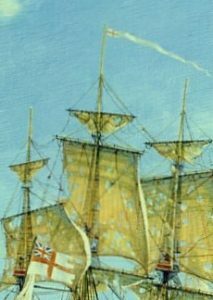 At that period British ships of war were using white, blue and red ensigns depending on which part of the world they were stationed. Today only British war ships may fly the white ensign, blue by special charter, ships on government service or those commanded by a RNR officer, not warships, from 1869 often had their flag marked with an appropriate symbol (Trinity house, the few Royal Yacht Clubs etc). The blue, used extensively world wide has been adopted by many Commonwealth countries. Other British vessels, merchant ships, yachts and so on fly the red ensign, occasionally by crown permission ‘defaced’ with a symbol as in the case of Bermuda. Affectionately called ‘the red duster’ the red ensign was often flown until near worn out, ready for use as a duster. The origins of British flags are very ancient. Today many countries including the U S A use a flag design based upon an earlier British flag. Both ships are flying their ‘commission’ pennants which indicate they are ships of war in service.